Katie Barnes with a banded female Wilson's Plover. Photo by Erik Johnson. All photos courtesy of @ibird4fun. Welcome to part two of this short series on gal bird banders. Katie Barnes, 29, is a professional bird bander and lead biologist for the Alabama Coastal Bird Stewardship Program on Alabama's Gulf coast. Originally from Pittsburgh, PA, Barnes has an impressive history of bird handling across the US and internationally (Costa RIca). Now stationary for the first time in years on a two-year term with Birmingham Audubon, Barnes marvels at having her own place after spending her 20s on the road doing field work. She also loves being a Yankee in the deep South, where she shared with me that she's a "Damn Yankee!" --someone from above the Mason Dixon line who came and never left. She's lived on the Gulf Coast for four years for her work, so welcomed this permanent position. 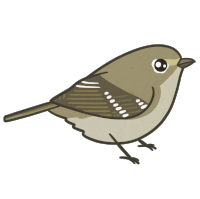 I found her through the wonderful algorithm of Instagram, where she posts her field photos as the playfully named but not totally accurate (considering she's a pro) @ibird4fun. Barnes and I emailed and Face Timed over several weeks, and I had the pleasure of meeting her pet blue Quaker parakeet, Skye Mall (Barnes has a sense of humor, can you tell? ), which sat attentively on her shoulder as we chatted. 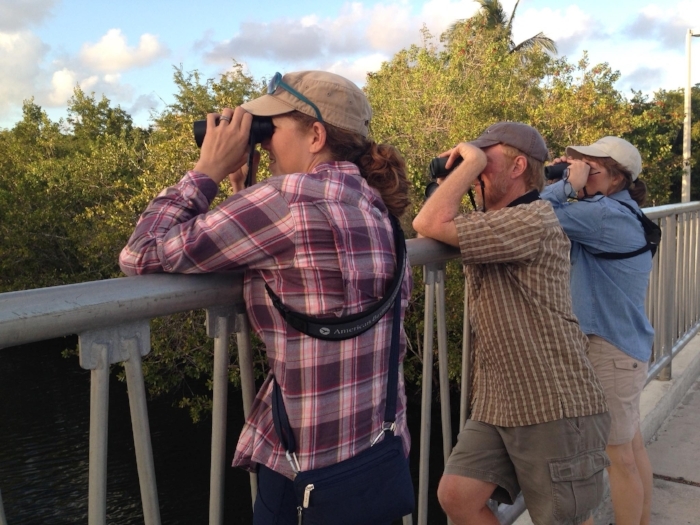 How did you become a bird bander? Katie Barnes: I was introduced to bird banding as a college student (age 18). I began volunteering with Northern Saw-whet Owl banding a few evenings a week at Powdermill Avian Research Center (PARC) in Rector, PA. Soon after I began assisting with passerine (songbird) banding. Received my training from PARC under the guidance of North American Banding Council trainer Robert Mulvihill, who was the bander-in-charge at the time. He now is an Ornithologist for the National Aviary in Pittsburgh. Additionally, he was on my Master's thesis research committee and has been an influential mentor in my pursuit to becoming a trained bird bander. How did you end up on the Gulf Coast? KB: Prior to my move to Alabama, I've been traveling the US working various field jobs. Field Tech/bird bander for a PhD candidate in Rhode Island, Bird Bander for the endangered Southwestern Willow Flycatcher for SWCA Environmental Consultants in Arizona/Nevada/California, Graduate assistant banding Louisiana Waterthrush for my Master's thesis, Bird bander at PARC, Wildlife/Forestry Biologist in west-central Louisiana banding endangered Red-cockaded Woodpeckers and running a MAPS bird banding station (passerines), Coastal Bird Technician for Audubon Louisiana (Coastal Stewardship Program) monitoring and banding Least Terns, Wilson's Plovers, Common Nighthawks, Bird banding intern for Costa Rica Bird Observatories (CRBO) banding neotropical migrants and neotropical residents across various habitats in Costa Rica (three months). This list is the paid seasonal work I've done. Now I am the lead biologist for the Alabama Coastal Bird Stewardship Program, monitoring and protecting nesting seabirds and shorebirds across Mobile and Baldwin counties (coastal Alabama). I'm working on obtaining a permitted banding project for Least Terns, Snowy Plovers, and Wilson's Plovers next season (2019). It is our very first year so the program is being built from the ground up and has lots of room for growth and expansion. We are currently in our first field season, and I'm learning where Least Terns and Snowy Plovers nest in Alabama. Planning to band more within this project in 2019. This is a grant-funded position with potential for funds for the next 10 years. Currently on a two-year term and loving it! In the meantime, I continue to remain active in banding with collaborators in Alabama and Louisiana. Close up with a Wilson's Plover at Rockefeller Wildlife Refuge in Grand Chenier, Louisiana. What's a workday look like for you? KB: Right now banding is not my primary job; that's why I go back to my old jobs (in Louisiana) to get my hands on the birds and keep up my skills. In my current role, we are doing mostly surveys. We get up early around 4 am, so we can be at the beach by sunrise. I look for beach nesting species--Snowy Plovers and Least Terns--that are nesting on Alabama's coast. We identify nesting areas and put up symbolic fencing. We do these surveys early in the day so as not to disturb the birds during the intense heat of later in the day. At this point in the season (mid July) we are monitoring the known nests sites, "monitoring to fate" as we call it; until all activity is over and the colony is completely done. Least Terns are colonial nesters, meaning they are in a large group of nesting pairs, for security. The breeding season can last til the middle of August, and starts as early as February with the pair bonds taking place then. Least Terns lay eggs as early as March or April, and will start over right away if they lose an egg to a coyote or a storm. I call them the world's best parents. They keep up with any kind of disturbance, sheltering their young under their wings. They are nurturing and fierce. The colonial nesting strategy is interesting to me. These birds are putting all their eggs in one basket by nesting together, thinking safety in numbers. Monitoring colonial sites is challenging because the birds look the same and each pair is at a different phase of nesting. And as I mentioned, if they lose an egg they will start over immediately. It's a dynamic line of work to observe. Least Tern chicks, Cameron, LA. I also assist in Snowy Plover banding elsewhere, using a technique called "twinkling" where we use net carpets and try to get the little guys running around without bands. We're working toward having that here, at my sites. We'd like to band the little chicks to determine nest success. A Least Tern in the hand. What is your observation of bird conservation in AL versus elsewhere in the US? KB: I'm currently still learning bird conservation in Alabama. Data gaps along Alabama's coast will be filled with baseline and long-term data sets through our coastal stewardship program. Alabama's beaches are highly developed and only a few areas are protected. My team provides protection for birds in the areas used by people. What is the response from locals to the work you are doing? KB: Lucky for me, Alabamans have a precedent for beach conservation programs. 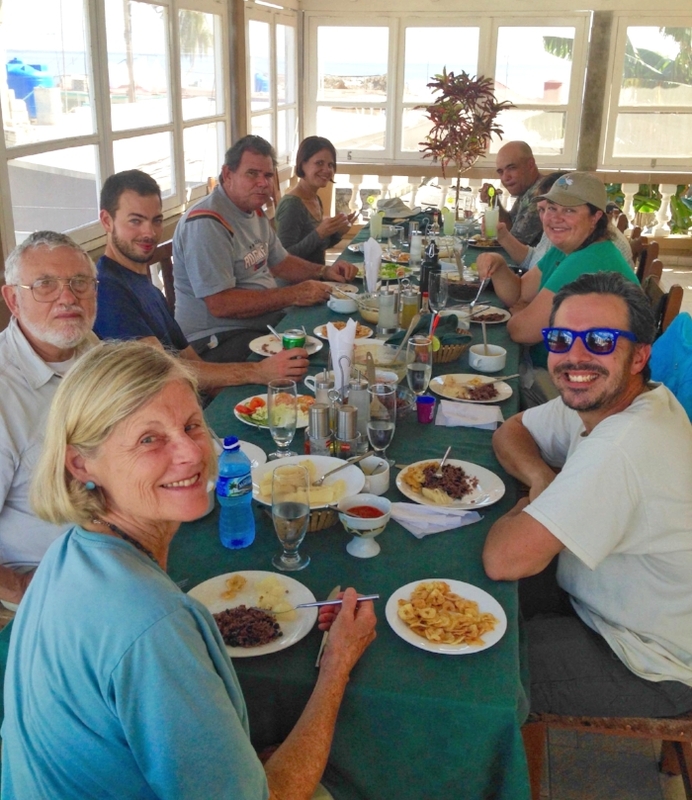 Share the Beach for sea turtle conservation is a successful program and what has been great about my program's first year is how receptive people are because of the turtles. Share the Beach sends a really good message for beach stewardship, and beach goers are interested in my work. It's fascinating to take volunteers out and watch their reactions to seeing these nesting shorebirds. Wilson's Plover nest. Holly Beach, Louisiana. How many Alabamans--especially women--are involved in this work? KB: Former executive director of Birmingham Audubon, Suzanne Langley (recently took a lead role with Audubon Texas) has laid the foundation as a strong female lead in bird conservation for the State of Alabama. She hired me, along with Emma Rhodes (Alabama native), our coastal biological technician. 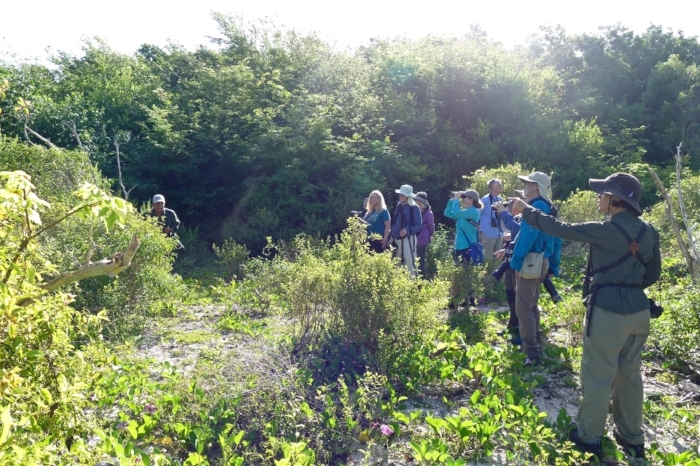 The Birmingham Audubon Coastal Programs office is 100% female operated! Nicole Love, our Coastal Program Coordinator, myself, Coastal Senior Biologist, and Emma Rhodes, Coastal Biological Technician. We also have National Audubon Society's Director of Gulf Coast Restoration, Kara Lankford (Alabama native) sharing an office with us and she is influential to our program as well. Women power!! The equipment of the job! Rockefeller Wildlife Refuge, LA. KB: Birds are my life, including my parrot! Moving to a new place has its challenges. But I'm used to this lifestyle. This is the first time on my own in one place. I've worked seasonal jobs that require shared housing in remote places, and I periodically returned home to Pittsburgh. It's a hard lifestyle if you're looking for romance, it's not for everyone. But I love my work and it gives me a lot of satisfaction. I'm somewhere in the middle; too old to party and too young to settle down! What is the most memorable birding or banding moment so far? KB: Oh this is a tough question. SO MANY memorable moments while birding and banding. Finding rare birds is always exciting! One of my favorite memories from spring 2017 was a Wilson's Plover nest I found with 1 egg on May 9th, nestled in a pile of nautical rope on the beach. The nest quickly became home to three eggs and I tracked it for an entire month. On June 9th, at sunset, I approached the nest to find three tiny, fuzzy chicks within the rope. It was as if they were waiting for me to come band them. Typically, if you miss the short window of banding at the nest, Wilson's Plover chicks are very hard to track down later. They are on the move within an hour after hatching, and are excellent at hiding in nearby vegetated dunes. So it's always nice when you time it just right and band them at the nest. I captured the beautiful moment in a photo which I've attached. A moment I will forever cherish. Successful Wilson's Plover nest, Holly Beach, LA. I've fallen in love with this region and the coastal birds and the rest of the birds of Alabama. It's a phenomenal place to be, watching these birds come over this body of water (the Gulf of Mexico) in one trip. It's been a really good migration this year for AL, walking the beaches we've had thrushes and tanagers coming in over the water and resting in the dunes. The winds were just right for these birds. Barnes with a Wilson's Plover, Holly Beach, Louisiana. What are your long term plans for your career? Will you stay in bird conservation/field work? KB: I plan to stay in bird conservation/field work! My current position is 90% field work and I absolutely love being on the ground with the birds, identifying nesting areas, installing symbolic fencing to help protect and educate beach goers about camouflaged bird eggs and chicks. Right now, Alabama's Gulf Coast is where I need to be. My primary focus is protecting and conserving the beach nesting birds that call Alabama home, all while growing personally and professionally. Side note- I was recently notified that my first-author paper on Louisiana Waterthrush breeding ecology (my Master's thesis work) has been accepted for publication in Northeastern Naturalist. Additional mentors that I would LOVE to have mentioned would be Luke DeGroote (current Avian Research Coordinator at PARC), Erik Johnson (Director of Bird Conservation for Audubon Louisiana), and Pablo Elizondo (Executive Director of Costa Rica Bird Observatories)- all key mentors that have been instrumental in my bird banding career (especially Erik-I just got back from Louisiana helping with his coastal banding program). All four names mentioned above are North American Banding Council (NABC)- certified bird banding trainers. If you'd like to read part one of this series, click here! Son Vireo gamely posing for his mother, pretending to bird off our deck. You can bring a child to the woods, but can you make him appreciate the birds? 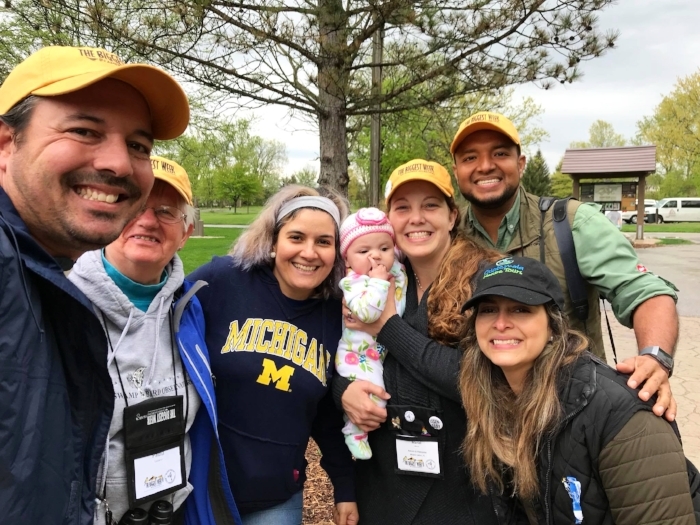 I recently participated in a very fun podcast hosted by the American Birding Association where I talked about just this topic. 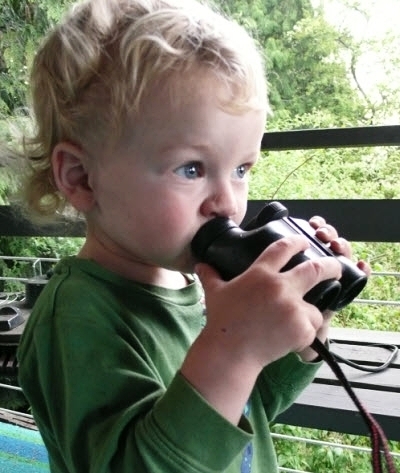 I've birded with my son (now 8) his entire life but he is at most, a reluctant birder. My love for birds has not rubbed off on him, yet. But I can keep trying! My son loves technology and learning about how things work. He is fascinated with what makes something functional. The optics of birding not only magnify subjects but contain complicated structure for a kid to consider. How do those things work, anyway? And how the heck do I look through them? We have a sturdy pair of small Nikons, which Vireo considers "his" even though he's loath to call himself a birder. I introduced him to binocs use at age three (below) and while he didn't quite get how to use the eye cup, he is now well aware of how optics enhance his world. Hiding among scopes at the Seattle Audubon Nature Shop. Age three, trying out binocs. Birding does not have to be a set aside trip of its own. Last week we rode the Anacortes ferry to Lopez island for a family vacation. Along the Anacortes ferry slip are nesting Pelagic cormorants, which you can see easily from the car deck. Depending on the tide and time of day, the ferry might sit directly alongside the structures, giving an up close (and aromatic) view of the active nests. This kind of happen chance, birds-en-mass opportunity works well for children like my son, who might respond with mild interest as the birds are right there and there are so many of them! Those are Pelagic cormorants nesting on structure of the ferry slip as we depart for Lopez island. Any kind of outing is so much more enjoyable for a child if there is a pal included. I no longer attempt any kind of birding trip with my son unless one of his friends is along. Whatever price I pay in little boy high energy zaniness, I make up for in real time to myself while they are off playing tag or stick war. On a recent spring hike to see nesting Tree swallows in the Skagit Valley, Vireo and his buddy amused themselves by racing along the dike, and enjoying the sun (though you wouldn't know it from my son's expression in the photo below). I added incentive to the two-mile hike by taking them for ice cream afterwards. Birding is usually more successful if there is a pal along on the forced march. Vireo loves the beach. He loves any shoreline for that matter, be it river, Puget Sound, where we live, the ocean, a lake, a creek. As we birders know, water features are a total draw for birds, so this combination of bird where you are and where the kid wants to go offers endless birding opportunity. While he can build forts or sand castles, I can bird. Lately he has developed a sense for if and when I might grab my binoculars, and his strategy is to deter my birding--I should be paying attention to him! He might catch a hint that a proposed outing is going to include my sneaking off to spot a bird or two. 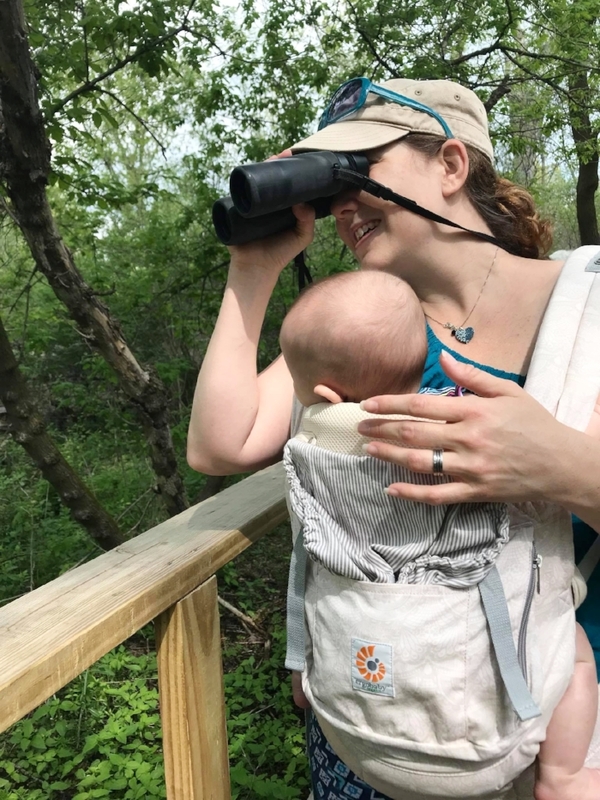 Thankfully, beaches and riparian environments aren't on his radar yet for mom's surreptitious nature appreciation, and we can both enjoy these special places on our terms. The boy loves the beach, birds or no. 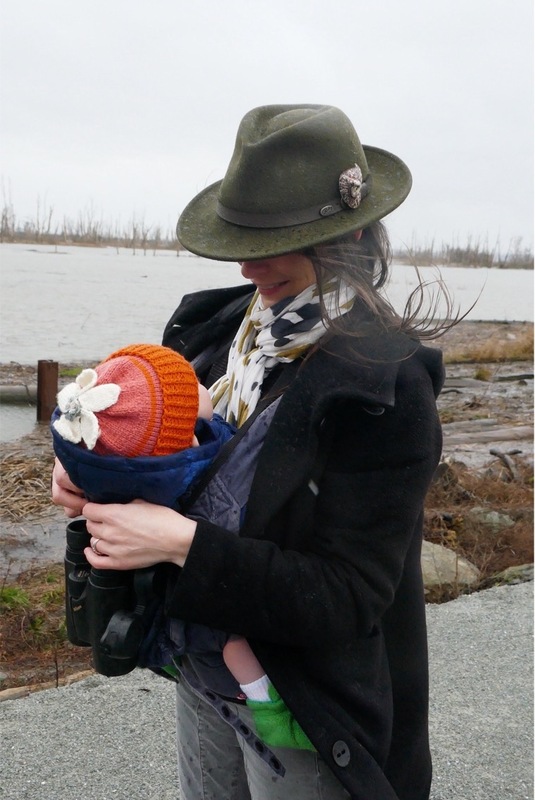 If you'd like more tips on birding with children, read this earlier post from a trip to Othello, WA to see Sandhill Cranes. Thank you for reading! Moi, looking très sérieux! This is my summertime uniform for birding; swapping out those sandals for sneakers if there's a lot of walking involved. Friends, here's an early summer idea download for aspirational birding attire. I'm an unapologetic lover of fashion and these images caught my eye recently. 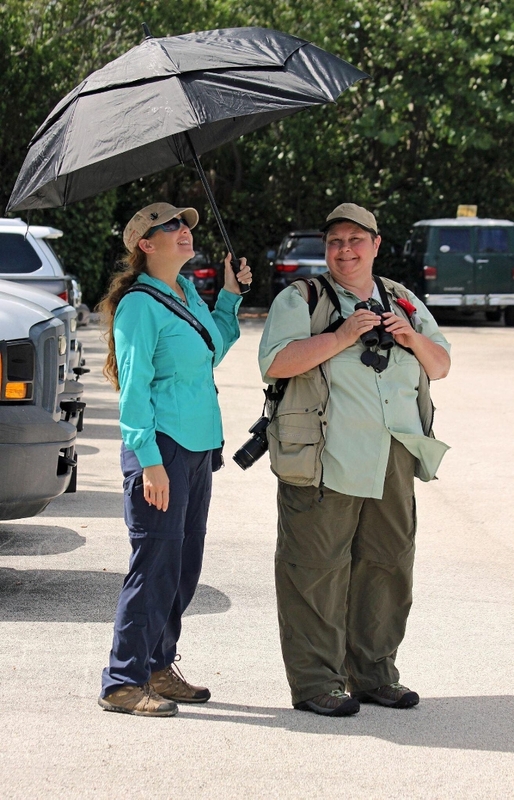 What makes a good summer birding outfit? You want ease of movement, layers for changes in temperature, and items that are machine washable. 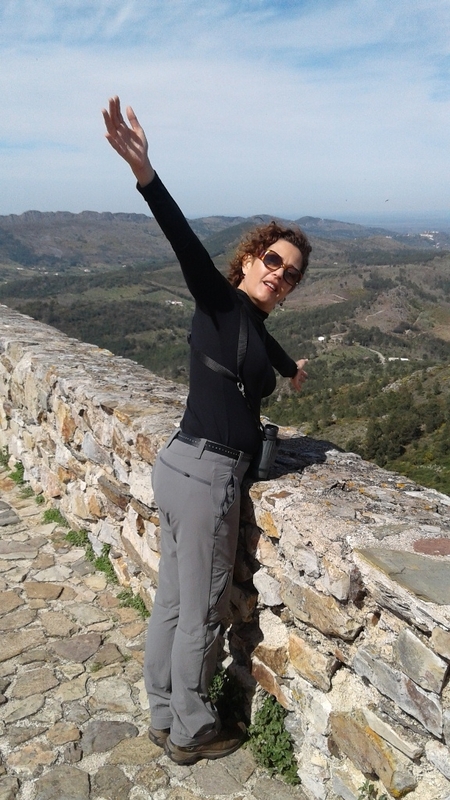 I wear long sleeves (to protect my arms from the sun), light weight layers, pockets (in pants only as buttons can catch on bag and bin straps), a sturdy cross body bag (I like this one) for my bins, phone and sunscreen. I'm a fan of neutrals, and somewhere, someone once supported this color choice, suggesting that bright colors can scare birds (source unknown, otherwise I'd link to it). But you be the judge. I've attracted a hungry hummingbird to my shirt once, it thinking I was a flower. And a hat--summer is a wonderful time to try wearing a hat. Juliette Hermant from the Atelier Dore blog. No, she's not birding, but her kit could be as one! Cross body bag, sturdy shoes, layers on top, and a fedora. Juliette Hermant from the Atelier Dore blog. Loose layers with pockets and structure. And the hat! Annie Novak, urban farmer, writer, illustrator, multi-hyphenate gal of the world, and a birder! Photo by Michael Hanson. Pants that won't ride up, deep pockets, shirt that doesn't show sweat stains, and the hat! Always the hat. I'm also a bit of a snob when it comes to footwear. Even shoes for tramping in the dirt or walking a trail can be cute, with no compromise on comfort. I've had good luck with various brands of tennis shoes and am not loyal to one in particular although whatever I buy has got to be olive, brown or dark blue (to hide the dirt). Converse has a lot of colors, as does Superga. I'm not the best person to ask in terms of longevity of a sneaker--I tread heavily and wear my sneaks out quickly, as walking is also my main form of fitness. This post is not meant to be exhaustive for all summer gear, just your sensible and put together bad self outfit. Have fun! BTW, I provide the links on this particular post in the interest of sharing, not making money. These ones ain’t affiliate.